It can be tricky to keep up with food fitness on the road, or working far away in isolated field locations. As a Humanitarian, Contractor or Logistician food fitness and health prevention ought to be on the top priority list to not end up part of a mission problem. In this post, we explore why what you eat matters and how you can make a difference to yourself and other by making food fitness part of your mission planning. Ever increasing pressures on humanitarian aid and relief workers makes wellness seem unimportant. Self-care and motivation to stay fit and healthy go out the window. The mission must go on. Safety, security, and access corridors are first priority (absolutely rightly so!). However, it is too easy for forget that you need to enable yourself to actually do the job. Ask yourself this: Am I fit enough for purpose? The GOODista looked at how to take exercise with you on the road in a previous post. Here we give you our best food fitness tips – and ideas how to supplement camp food finery with your own fitness food choices. Keeping fit starts with you. Self-care and motivation need fuel: Fitness food. Fitness Food: What is that? As someone who works in field location you are on the move a lot, multitasking with Smartphone in one hand, and the handheld Radio in the other. You take in as much information as you deliver while walking around the compound. As you jump in and out of cars, airplanes and cargo trucks, you stop only when you must and rest little. Your daytime meals are taken in a rush, and you only sit down at night when hunger pangs have been stilled by pre-dinner beers, making the daily nutritional intake a bit of a sham. The result of a few field rotations is a rather drained look, and an overall unhealthy mix of overwork and under-nourished grayness under the suntan. To keep the motivation going, you can change a few things even as choice and access are limited in your location. Start by giving yourself real food fuel to get through your days. The Healthy Eating Pyramid above is perfect for an everyday person – and indeed how the basic principles in a ‘normal’ environment should work. Your needs and nutritional intake will be similar to an athlete – or hard laborer. Nutritionally you need three stable balanced meals, with healthy snacks in between to keep your energies going throughout. Health Prevention: Participate in field mission briefings, including the health tips. Get your vaccinations, malaria prevention and first aid kit sorted. Health prevention is your best defense against unwanted illness/disease. Pack hand sanitizer liquid, bacterial wipes and spray band-aid are great to pack. Shake hands with people, and interact as you normally do – but use the hand sanitizing liquid often, and take showers (if you can) before going to bed (unnecessary to drag bacteria with you into your night clothes and bed linen, right..). Make smart choices when it comes to foods (see below) and spice it up as ginger, turmeric, curry, chili have natural anti inflammatory properties. Supplements: A ‘normal healthy person’ does not really need supplements as choice and access to a healthy balanced diet can be found. However in a field setting, you will need supplements: Omega 3, Ginseng, Ginkgo and probiotic are great choices. You can buy these online via Amazon.com, or eChemist.co.uk. Choosing from a Canteen: Field location canteens can be a great source for healthier foods if you look carefully. Think color! The stronger the color the healthier it is. It may be better to avoid soups (they can be bacterial nightmares) and consider bringing white vinegar to wash salads with. Fish or meats are great protein choices, and better grilled than boiled. Eggs are better hard-boiled than soft, and vegetables grilled or cooked are better than raw (or use vinegar to wash). Grains, legumes and darker bread are super for slow burn carbohydrates. 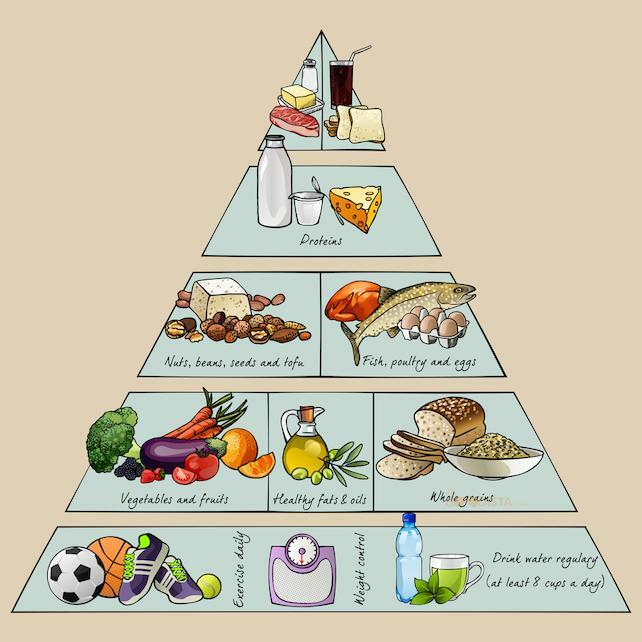 Look at the food pyramid above and make balanced choices to fit your field setting. Cook for yourself: Add to your field canteen choices by bringing along a juicer and a food processor. That way you can buy local produce, fruits (or ‘borrow’ from canteen) and make your own raw juice, cold soups, vegetable salsa etc. This is a real solution if you worry about not getting enough fruit and vegetables – and if the canteen may not provide the best choices. Food processors also allow you to make your own peanut butter – a great choice for snacks, healthy and tasty treats. These days you can buy excellent mini juicers and food processors that are as easily packed as any other travel item. Feed your morning: What ever you do – have breakfast. Cereal, Porridge, Omelet, fruit and (your own) juice will set you up and keep you going for hours. Just coffee and a sweet croissant will drain you after a very short while, so think slow burning grains and fiber. Feed the Chef: inspire your chef or canteen cook. 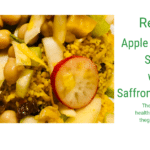 If you can make friends with the Chef and inspire them to cook healthier options. Your culture may not be the same, and you may even learn new things too. Shared interest in food is a great ice breaker and if you have Internet access you can share sites with healthy cooking recipes. This may lead to greater food choices not only for you – but also for your equally ‘health’ starved colleagues. Get a ‘get fit’ club going. As corny as it sounds, any excuse to think of other things than what is happening around you is good for the mind and ‘spirit’. Water, Water, Water: Hydration is key. The food pyramid above illustrates vividly how essential hydration is when you are on the move as much as you are in your work situation. You need to think 8 glasses of water a day – minimum. If you have access to lemons – start your day with water and lemon juice. It’ s a great cleanser, and anti-stomach bug medicine too. Alcohol dehydrates and clouds the mind, so take a bit of care of yourself in this department. As much as you may ‘need’ a beer at the end of the day, keep tabs of the units as alcohol also drains the mind. Alcohol is of course not a fitness conscientious choice anyway so stick to water as much as you can. Local Delights: You are in luck if you are able to leave the compound, as this gives you the opportunity to check out the local market. You will often find farmers selling their wares and local staff who can guide you. This gives you far more options and choices. A great thing with spending time in an international multicultural setting is that you can trade recipes, and ideas for how to get your own foods more interesting. You can choose what to bring with you, and the internet is a great place for ordering all your food fitness items conveniently. By ordering fitness foods in time for packing, and maximizing health prevention by taking with you a juicer and/or food processor you will be more set up for healthier choices. Once you are on base, you can share what you have with others, and vice versa. Getting to know what keeps your energy levels going starts with feeding yourself properly. A bit of planning makes for a great start to a healthier stay in your field location. You can Feel, Be AND Do Good. If you want more tips, recipes, ideas, and motivations about lifestyle changes you can do – subscribe to The GOODista. Thank you for really good advice! Whoever has suggested a juicer and a mixer in the field setting before? Bravo! Also sound advice for everyday life!